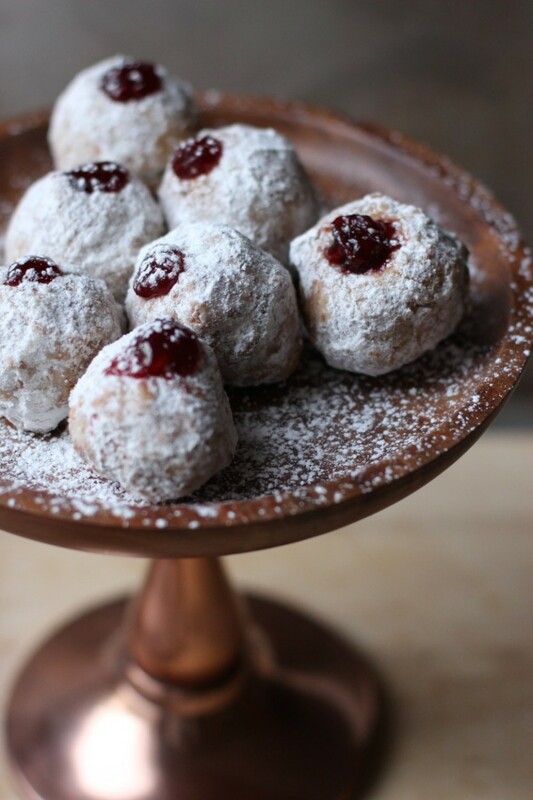 Coming from first-generation Russian Sephardic Jew immigrant family, we didn’t have homemade fried Israeli-style “sufganiyot” jelly doughnuts. Then again, we weren’t a very traditional “Jewish-food” kind of family. Eating Russian food like plov (lamb and rice pilaf with carrots) and a savory cabbage stuffed with ground beef, instead of brisket with sweet glazed carrots was the norm at the family holiday gatherings. But I do remember my Mom buying ponchiki (Russian for doughnuts and a close cousin to the Israeli version) from Brighton Beach, Brooklyn. Underfilled (never enough filling) with cherry jam or vanilla creme, is how I remember them – and usually coated with sugar. 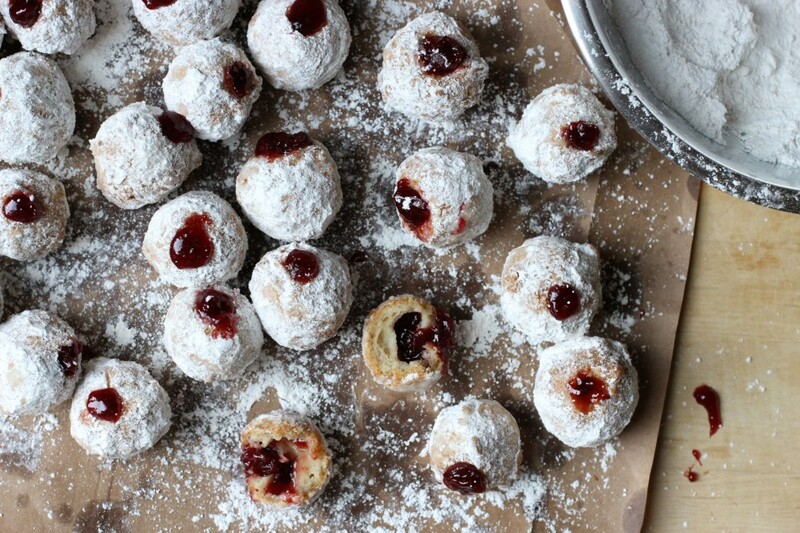 Albeit untraditional with our Chanukah table, doughnuts always made their way to the table. Since adapting to gluten free/dairy free/soy free (and other ‘frees’) I thought those would just be a fond memory. UNTIL NOW. 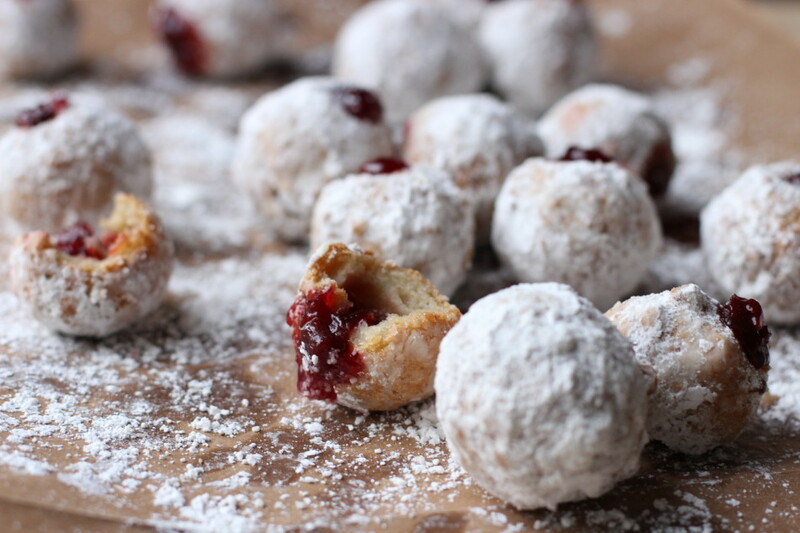 After several attempts perfecting this dangerously addictive recipe, we now have the most amazing jelly doughnuts. I kid you not when I tried the first one I couldn’t believe it was gluten free, dairy free, and soy free. One doughnut…ten doughnut, who cares. We’ll count calories in January, okay?? Oh and making these are way easier than they look. Really. You’ll need a food processor to finish the choux for best results, as well as a candy thermometer. Frying oil, lower than the desired temperature results in some soggy, greasy food, so it’s a must, but can easily be found in most stores for under 10 bucks. 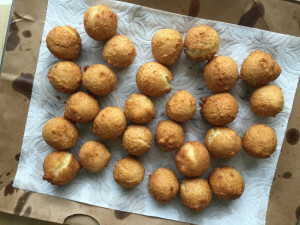 These taste similar to the Italian deep-fried doughnut bombolone, which resembles more of a doughnut hole that is filled from the top. 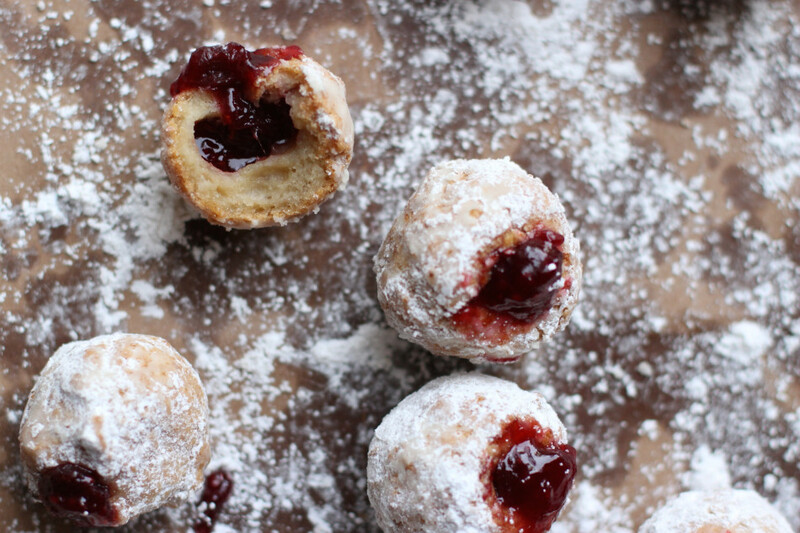 I went with powdered sugar instead of granulated sugar to resemble sufganiyah and filled it with cherry jam. You can use any jam you like or fill with lemon curd. With the extra flour blend, you can make them both ways. The one thing that stands out most is texture; the choux dough gives it a beignet, fritter-like texture, a superbly light dough that tastes and feels like a yeasted doughnut with a slightly crisp exterior. 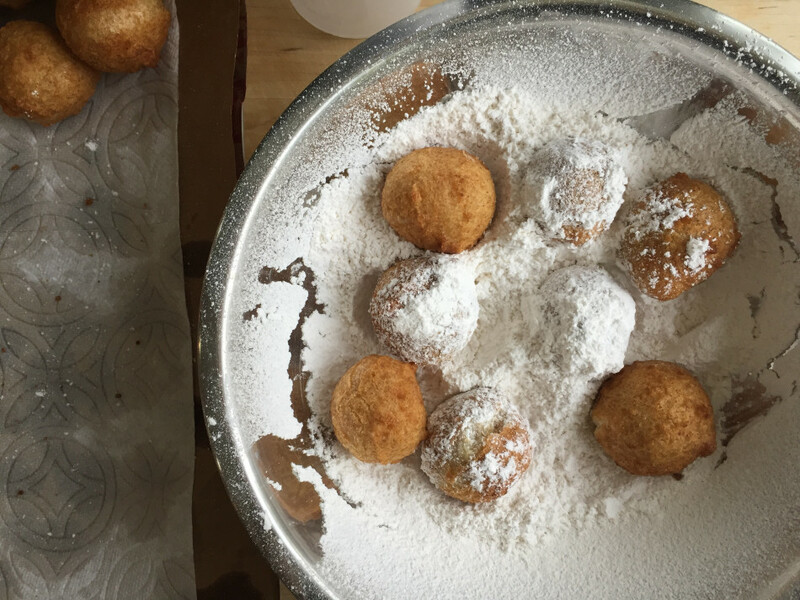 Without jelly, they taste exactly like beignets, yet look like zeppoles … a perfectly sweet fusion! After lighting the menorah we dove in. I am so excited to share this recipe with you. 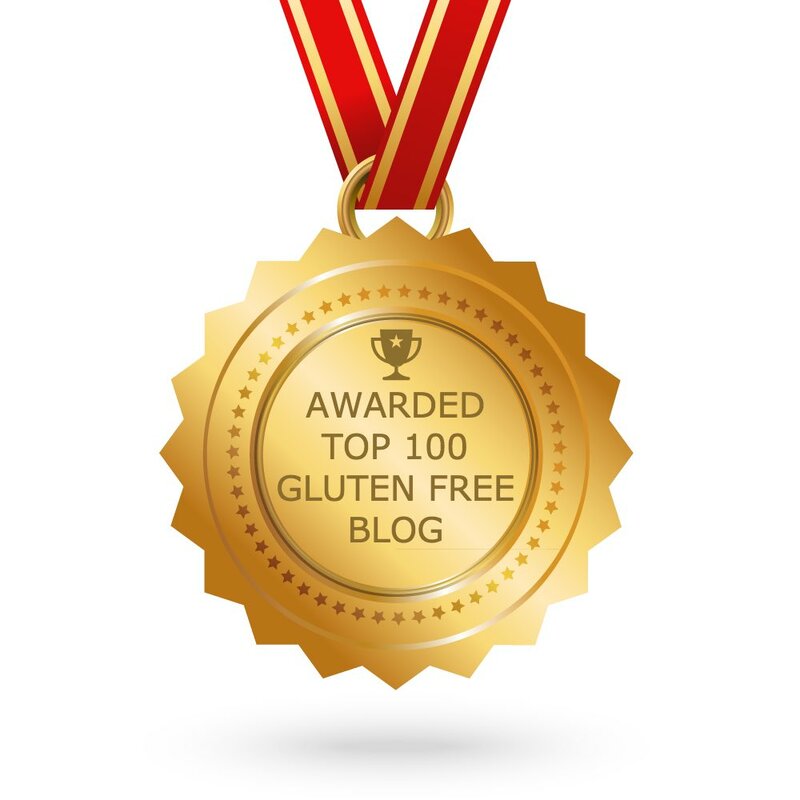 I have been working on it for some time now, to make it yeast-free, xanthan & guar gum free and have finally got it. 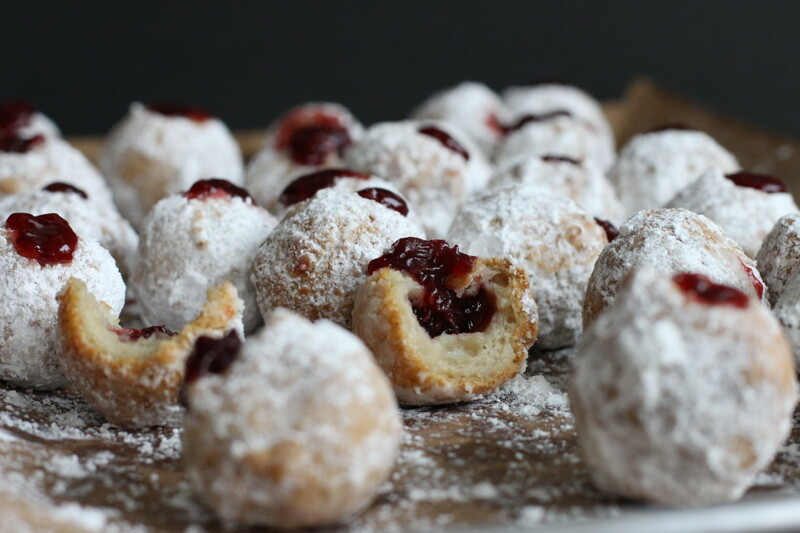 I use gums or yeast sparingly helps keep my twin boys guts in good shape, so you can imagine how thrilled I was with this version of sufganiyot. The psyllium husk is a brilliant substitute I learned about in the cookbook, Gluten-Free Artisan Bread, in 5 minutes a day, an ingredient worth stocking if you bake often. I have tried agar agar powder, but it tasted gummy so I nixed that. Egg-free came out very dense, not like a doughnut but more like fried cake. That was a no-go. My oldest son who has a hard time with eggs had 3 doughnuts yesterday because the packaged (egg free) ones in the freezer weren’t as appealing as these. I didn’t know how he would react so I made sure to have activated charcoal on hand, in case of a sneezing attack. Btw, in case you were wondering activated charcoal is given in the event of poison intake; it literally binds to everything and draws it out of the body. Thankfully it wasn’t enough egg to cause a reaction. He feels fine today (yippeeee!! ), so maybe, just maybe, he is okay with eggs in recipes as opposed to fried eggs with yolks on the rare side. He has been taking digestive enzymes with every meal, zinc picolinate and lots of krill oil to help fight food intolerances … I think it’s been helping. With that said and as you probably know, food intolerances (severity varies depending on the level of intolerance per an IgG blood test) are very different from Celiac, an autoimmune disease and food allergies, so a nutritional supplemental approach like this may help but certainly does not mean you should have a little gluten or dairy or whatever food it is that is creating a severe inflammatory response. Here are some visuals as a guide, if needed. Frying after about 30 seconds. Let it cool a minute. You will notice they have a “split” in some, as if the dough seams have split. Do not worry, that is a good thing and will result in a lighter-than-air center, similar to a beignet. 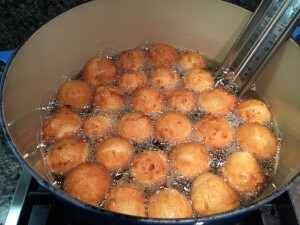 Turn oil back on to temperature and fry one more time for 20 seconds to crisp up the doughnuts and cook through the center. Ready for the sugar coat. But first, we prepare the pastry bag. Unclip when ready to pipe. It’s time to rock and roll, or coat in sugar. Fill with jam and eat! 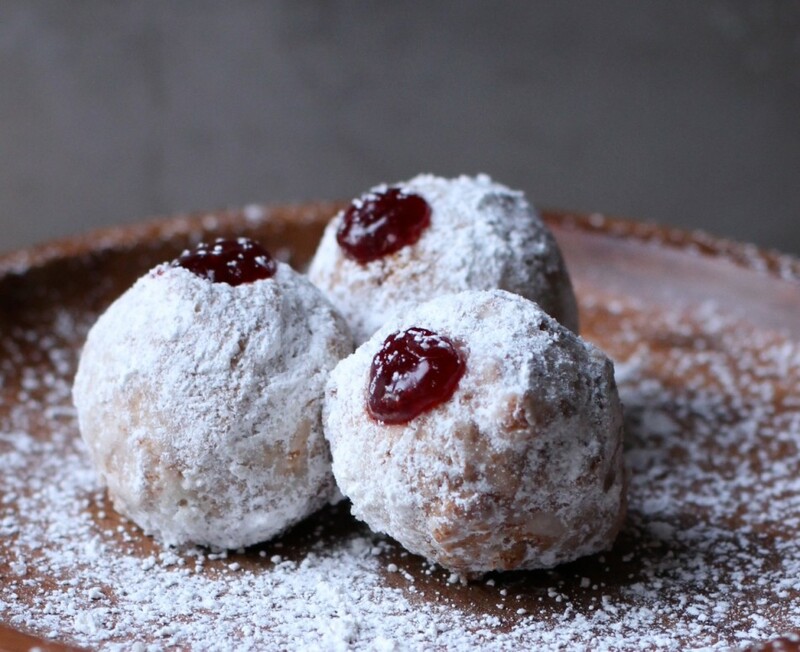 These lighter than air jelly doughnuts are made with a choux dough, similar to a beignet and fritter generously coated with confectioner's sugar and filled with sweet cherry jam or any jam you prefer. A Chanukah doughnut, aka sufganiyot, that isn't greasy and very addicting! Note: Prep Time includes chill time. For the Doughnut and Fritter blend: Measure each flour and psyllium husk into a sifter set in a large bowl. Sift the mixture and repeat several times. I did this ten times to ensure all the different starches and psyllium husk are well distributed. A necessary step for best results. 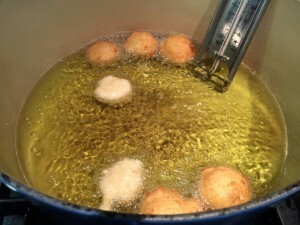 To make the choux paste: In a small bowl, crack the eggs; do not whisk them. Sprinkle the baking powder evenly over the eggs to fully cover them, and let it stand for at least 5 minutes, so the egg whites activate the baking powder. It will look like big foamy bubbles. 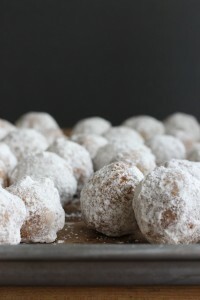 Prepare the 1 cup plus 6 tablespoons of Doughnut and Fritter blend, set aside. In a heavy-bottomed medium stainless steel saucepan, combine the non-dairy butter, coconut milk, sugar, kosher salt, and 5 tablespoons of room temperature or cold water over medium heat and heat until the “butter” has melted and the mixture comes to a gentle boil. It should just gently boil in the middle of the “butter” mixture, not along the edges of the saucepan. 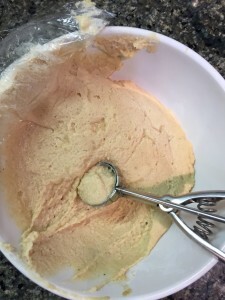 Add the 1 cup + 6 tablespoons Doughnut and Fritter Blend and stir vigorously with a wooden spoon, scraping the bottom of the pot and over, into the dough, for about 1 minute. Once the dough pulls easily from the sides of the pan and leaves a thin veil of butterfat on the bottom, it's ready to come off the heat. It should come together clean and not sticky or wet-looking. 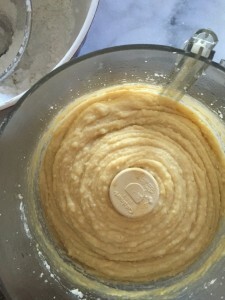 Transfer the dough to a food processor fitted with the S-blade. Pulse (just for a second) the dough 20 times to cool it slightly. Lift the lid and pour in the eggs and baking powder (still unwhisked) and pulse (now holding down the pulse button for about 3 seconds each time) about 20 times or until it appears to be a thick, sticky paste. Add the vanilla and mix just until incorporated. Transfer dough into a clean mixing bowl and seal with plastic wrap directly clinging to the dough. Refrigerate the dough for 1½ to 2 hours. This will also keep fresh refrigerated for up to 3 days before frying. In a small saucepan, melt the jam over medium heat until it is liquid Strain the jam through a fine-mesh strainer into a bowl; discard any solids left in the strainer. Set the jam aside to cool completely. Transfer the cooled, strained jam to a pastry bag fitted with a plain round tip (I couldn’t find mine so I used a star tip, which worked fine) and sealed with a paperclip just above the tip. This will prevent any of the jam filling from seeping through the pastry tip while waiting for the doughnuts to cool. Set aside. 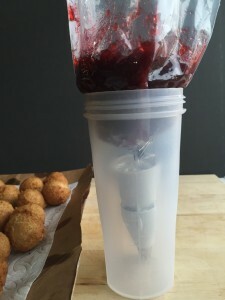 I keep my filled pastry bag standing upright in a large smoothie drink container, then remove the paperclip and press the jam down into the tip just before filling the doughnuts. 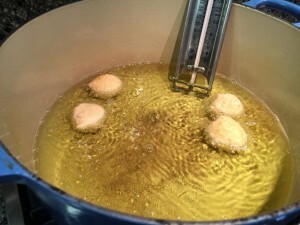 In a cast-iron Dutch oven or large heavy bottomed pot (or alternatively, in a deep-fryer), heat the oil over medium heat until it registers 375°F (190°C) on a deep-fry thermometer. Line a rimmed baking sheet platter with brown bag or paper towels. When the oil has reached temperature, use a mini ice cream scooper or dry measure tablespoon to scoop the prepared choux paste then firmly press and release each scoop into the hot oil. Careful not to burn your hands! Working in batches of five or six doughnuts at a time, fry for about 1 minute then turn over for another minute until golden brown with some dark brown crust. Using a slotted spoon or strainer, transfer onto a lined baking sheet. Repeating with remaining dough. Remove from oil (leaving the heat on at 375°F (190°C)) and let it cool for 1 minute then add all (if pot is large enough, or in batches) back into the hot oil for another 20 seconds. A necessary step to ensure the dough has cooked through. Note: Do not overcrowd the doughnuts, or allow the oil temperature to drop below 375°F (190°C). This will yield a crispy doughnut on the outside and tender, yeast-like consistency on the inside. Meanwhile, pour the confectioners (powdered) sugar into a wide bowl making sure there aren’t any lumps (sift if needed). When the doughnuts are cool enough to handle (about 10 minutes), roll a few at a time, generously, in the sugar to fully coat. Pierce a doughnut with the pastry bag tip and pipe about 1 tablespoon of filling into the doughnut. Repeat to fill the remaining. Ideally, these doughnuts are best eaten the same day. 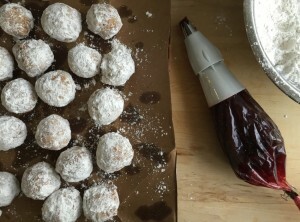 If the doughnuts residual frying oil absorbed the powdered sugar before serving, hold each in the confectioners (powdered) sugar to coat again. If you have any leftovers, store in a brown paper bag or in a loosely covered container on the counter for a day or two. These are not freezer-friendly, but as noted in the recipe, the choux dough can be made up to three days in advance. WOW this looks amazing! Pinned for the weekend! Thanks Cheyrl, I hope you enjoy!! How did you make this yeast free?!! I have tried. I can't wait to bite into more than a few. Gorg photos! 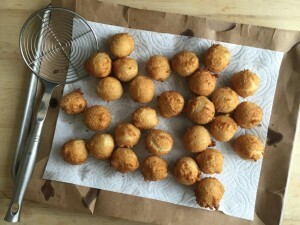 I have too and they would come out dense so I decided to look into making it more of a fritter dough, also sprinkling baking powder over eggs to acts mimics yeast. Give them a try...hope you will love it as much as we do! OMG that bit into photo!! 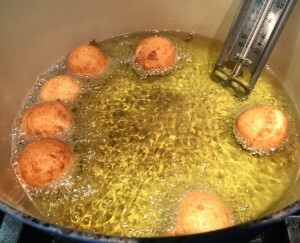 CI remember my Mom frying up huge doughnuts as greasy as can be but totally addicting. She doesn't make them gluten free so this is like a Hanukkah miracle because they look amazing! Have you ever made them larger sized? Thanks Zoe! 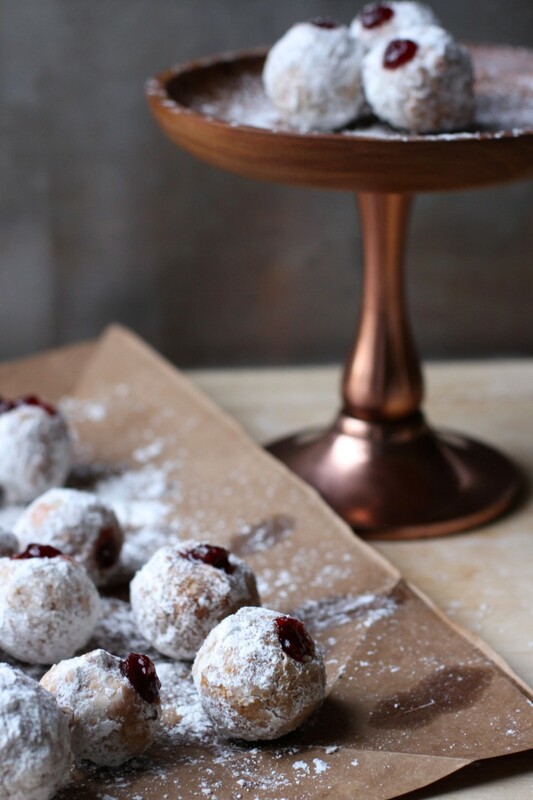 Though I baked doughnuts most of the time I can't resist frying them this time of year and for us, like you, it's such a treat to have a fried jelly doughnut. Hope you try them, they are a must fry! I haven't made them any larger than doughnut hole sized. I don't see why it wouldn't work, but can't say for certain. I can't wait to try this! I was wondering if "a gentle boil of non dairy butter" means to simmer or something else? Thanks and Happy Hannukah!! It's just past a simmer where you begin to see a few bubbles (not more than a few minutes on med heat) in the middle then add the prepared flour blend and whisk vigorously... Happy Chanukah! I have tried guar gum and find it tastes on the gummy, stringy side, not like a true beignet type airy doughnut. Not horrible but not something I would make again. They do sell psyllium husk at Whole Foods or health food stores. Hope that helps. 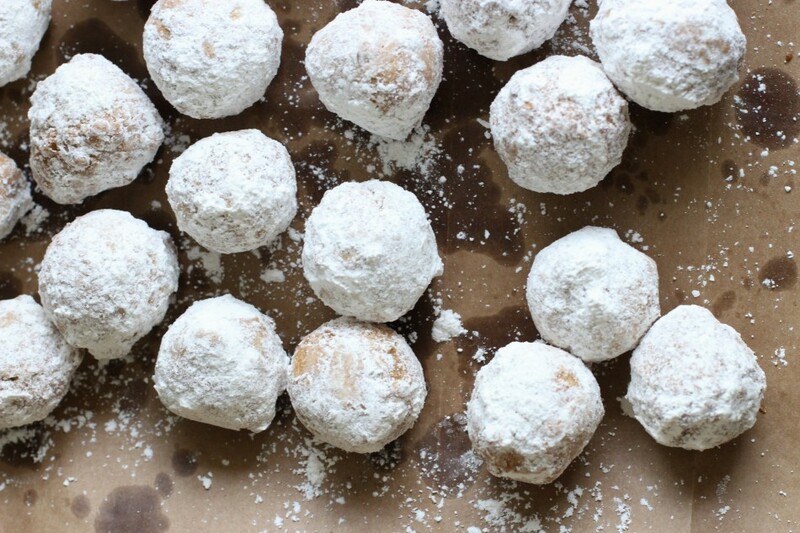 Looks so much like zeppoles...an obsession I thought I had to give up forever until this came into my inbox. I don't have a food scale yet, will the scoop and level measuring give me the same results? Love zeppoles! Gina, you will love this recipe, they taste very similar to zeppoles and don't be shy with the powdered sugar either! I'm finding that using a scale gives consistent results so yes it's definitely worth getting. Before using a scale, I would find a recipe would come out great then another time (with a lighter or heavier hand depending on the day) the recipe doesn't come out the same. This didn't happen so much when I used to bake with gluten, but common when baking with gluten free flours so I measure and take MANY notes to make it just as good again and again. It will probably be fine without a scale, but if available a scale is a baker's best friend (well, that and an oven thermometer!). Hope that helps. Do the eggs need to be room temperature? Want to make this tomorrow! I had mine out at room temperature for 15 minutes and they were fairly cold, room temp is not necessary. Enjoy! This looks unreal like so many of your recipes!! Your mac n cheese is a once a week thing. I'm also curious if I really need to measure the flours or not? Definitely willing to buy one to make these if I need to. Happy Chanukah! Thanks so much Beth!! 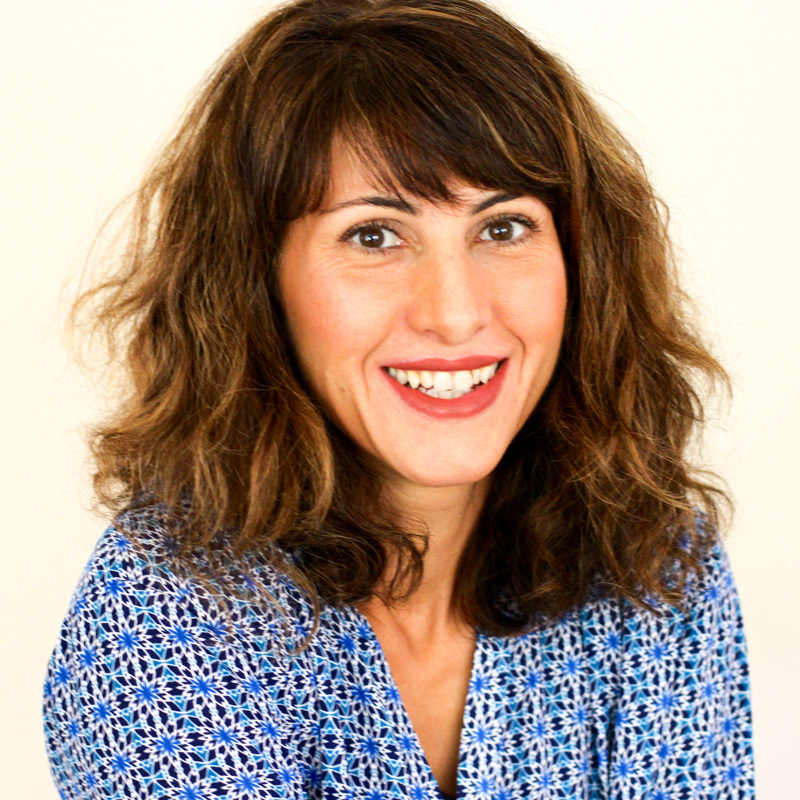 Yes, if you can, for consistent results (see my comment below on why)! Happy Chanukah and hope you enjoy!! You must, they are too good to pass up! Enjoy!! First off your dough and frying photos made me feel confident enough to make this so thanks for that. Secondly, I measured and followed your recipe to a T and holy moly are these delicious! I see what you mean about tasting light and airy like zeppoles! I filled mine with raspberry jam and didn't strain the seeds and it was fine with a medium plain tip. Thanks for such an amazing recipe!!! We call them berliner in German. My mother always used yeast and filled with raspberry jelly. They were bigger than this but looking at the bitten one I could not resist frying this since gluten and dairy do not agree with me. I am very surprised at how good these taste (my boyfriend and me at ten already). I do not have a candy thermometer so I dropped a dime size piece of dough in the oil to test it like my mother would and they fried perfectly. I'm afraid we may eat them all tonight! We ate them all with no regrets! I'm so happy to hear you gave the recipe a try and you and your boyfriend enjoyed them - YAY!! Good way - by the way - to test oil! My mouth will feel incomplete until one or five of these is inside. When I saw the first picture, I thought OMG. I'm afraid to make these because I will eat them all myself. How do you spell self control? Hi. How many donuts does your recipe make? The recipe makes between 28-30 mini doughnuts (should be in the yield section of the recipe). They are about 1 1/2-inches in diameter.